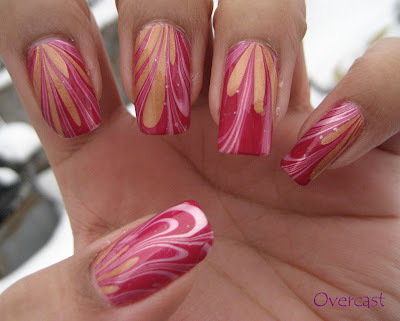 So, I thought I should do a Valentine's Day water marble (a couple days ago ... this was Tuesday's NOTD). I'm pretty happy with the way the design turned out, but I really was not loving the pink on me. Really not sure why but it bugged me a little bit all day. I usually - but not always - stick with the same brand for all colors of a water marble. It's not that different brands don't work together, more that when you stick to the same brand, they're more likely to have the same consistency, and therefore a more even spread .. but even then that's not always true. The 2 main rules to great water marbles: Practice & Experiment. More to come =) Thanks for reading. Awesome Tutorial, some of the tips were just from watching closely...I think I'll try this again over the weekend. Thanks for putting this together! This is the *very best* water marble I've ever seen!!! wonderful and beautiful! What a great tut! Waaaah!!! Why can't I do this?!!! very very cute and romantic! I'm not a fan of nail art, but I LOVE the water marbles, and this is one of the prettiest I have EVER seen! It's just gorgeous. Neato. I really need to try this. 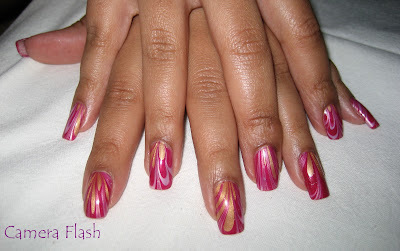 Wow, that looks amazing, you are so talented at marbling! i left a comment on your video - SO PRETTY!! That is a really amazing video tutorial. Thank you so much for teaching me how to do it. I will be trying this out sometime. Your finished product is so amazing! Hi, my name is Heather and I have been a nail tech for over ten years. I came across this technique and was brown away. I love it.!!! I am going to try this right away. Thank you for sharing. Two questions. Have you done just the tip of the nail and can you do more then one finger at a time? Haven't come across any examples of this yet. Thanks again. what fot water do you need ?? 1. What kind of tape did u use? 2. What is an orange stick? I live in Australia therefore I am not familiar with an orange stick. plz temme d nail paint brands dat can b used for water marblin! weneva i try doin it d nail paint does not spread! do i hav 2 see netin specifically while buyin a nail paint for water marblin? it is sooo cool,but wat d we do if we do not have exactly the same brand of nail polish? ADORABLE! That's like the coolest thing ever and I'm way excited to try it. My roommate and I are going to try doing it tomorrow and we're totally blown away that this works. Your video is so extremely helpful. Thanks so much for sharing with everyone! i am mainly curious as to if the best result relies on a fake nail rather than i natural nail? or is the result the same? is this only water or something else? 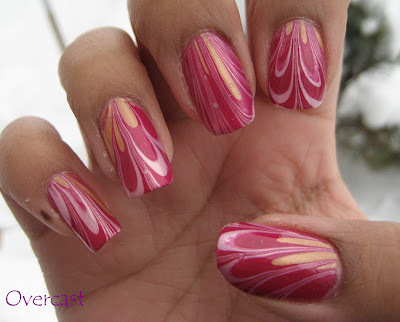 how we choose the right one nail polish to do this water marble nail art? CYNTHIA - finding the right polish is all trial & error - also are you using room temperature filtered water? is it really needed to used filterd water?? ?can we use the simple water,no the filterd one? i have a question on how you got your blog how it is because mines just a blank page and wont do anything so i was wondering if theres a button to push or something!........PLEASE HELP!!!!! So so awesome! Gonna try this out now even though Valentines has passed. it's badass! And I was wondering if you would like to exchange links with my blog. You may aware that exchanging links would be a mutually beneficial arrangement and also very helpful in increasing traffic or visitors for both the websites. If you are interested in exchanging links, please feel free to contact me at your earliest convenience and I will send you more details. Love this technique but I am getting very frustrated! I can get everything right apart from transferring the design onto the nail. Every time I put my nail in and remove the excess but when I lift the nail from the water it just looks a big gloopy mess! Do you have any advice which may prevent this? Just an idea, have you tried different brands to see if that avoids the gloopy look? Amazing tutorial. I haven't thought that water can also be a way to have an exquisite design for your nails. I really love it. Maybe I'll try this sometimes. Very cool. I was wondering if by any chance you know if this technique will work to create an art piece? For example marbling a canvas. I love your blogs, I have been trying the marble look and I love it, I just have one suggestion. Let everyone know not to work in an area that has air blowing on the cup, such as the AC (air conditioner) or heat. Because it dries the polish very quickly and makes it difficult to draw the orange stick through the polish and you end up wasting a lot of polish. It is just a suggestion. Do you thin your polish down? Because mine does not spread like your's does. May i know what brand are you using? hey it was lovely.I have tried with some of the colours but its not spreading. are there any specific brands to use?